Yesterday I took my mother out to lunch at Thousand Cranes on the garden terrace of the New Otani hotel in Little Tokyo. I had the Tenshin Sampler ($22.50)which was basically kaiseki, a large assortment of small dishes each with unique flavors and ingredients. The first course was three delicious dishes, the first was two cubes of deliciously slimy mountain yam with a vinegar chili sauce that reminded me of kimchi brine along with some small orange eggs that were larger than flying fish or smelt roe, but much smaller than salmon roe, but just as fishy tasting and some shredded raddish of some type, possible daikon. The second dish was an unagi and shittake savory custard that came in a covered dish and included a spoon for easier dish to mouth transport. The content of the third plate totally escapes my mind and I didn't take a photograph of it, but I remember enjoying it. When the main course came, I could tell my mom was jealous that she ordered the City Sampler($19.95) which didn't come with a first course, but when her tray of dishes came she was very pleased with her selection. My main course consisted of 6 dishes, not including the steamed rice and sauces. Clockwise from the top, the first dish was some type of fibrous tuber in a sweet soy sauce with two pieces of gooey okra on the side. The second dish was several thick slices of salmon and yellow tail sashimi with both daikon and western radish, seaweed, shizo leaf, lemon, wassabi and soy sauce. 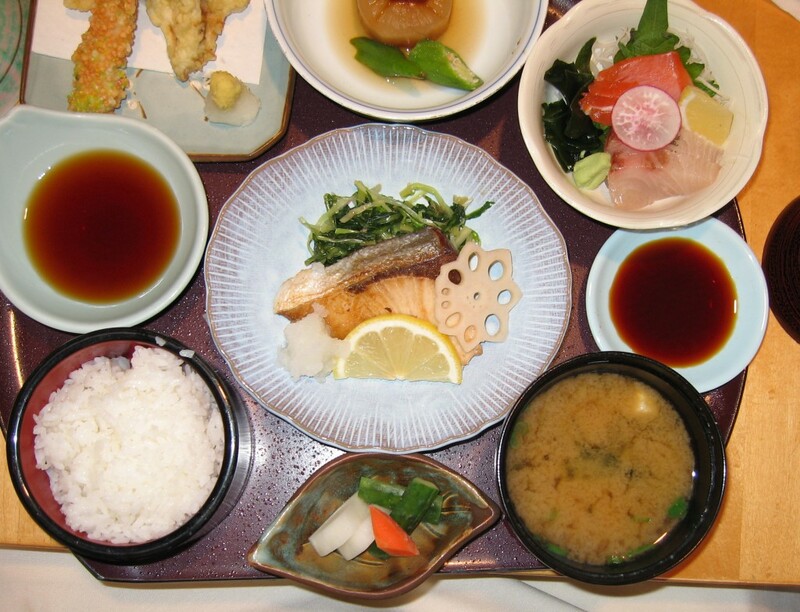 The third dish was a steaming hot bowl of miso soup with the customary tofu, seaweed and green onions. The fourth dish was a small sampling of daikon, cucumber and carrot pickles that were firm and mildly acetic. The fifth dish was an unusual twist on the conventional shrimp tempura obtained by covering the battered shrimp with crunch rice spheres before frying, along with typically prepared yam and enoki mushroom tempura, the sauce for which was enhanced with the optionally added cone of daikon radish and garlic. The sixth and final dish of the main course was a sizable portion of perfectly broiled yellowtail garnished with a crisp slice of lotus root, daikon and lemon atop a bed of tender sea vegetables flavored with bits of bonito. The service was great and the desert of mango ice cream and a sugar cone cookie complimented the complimentary hot green tea served after the meal. The food was wonderful and I look forward to going back soon.